Granite & Quartz division Quality Countertops from the kitchen brand you trust. Celebrating 35 years of creating dream kitchens! Thank You London for voting us Londonâ&#x20AC;&#x2122;s #1 Kitchen Renovator! With the grey days of winter upon us, most of us look indoors for visual relief from the cold and the snow. Colour is a powerful decorating tool and it's one that can either inspire us from the moment our feet hit the floor in the morning – or set our teeth on edge. I was interested to learn that Radiant Orchid, “a captivating, magical, enigmatic purple,” is Pantone's Colour of the Year for 2014. A world-renowned authority on colour, Pantone advocates incorporating Radiant Orchid in fashion and cosmetics, as well as in paint, accent pieces and accessories. “As adaptable as it is beautiful, Radiant Orchid complements olive and deeper hunter greens. . . . . Likewise, the vibrant color is sure to liven up neutrals including gray, beige and taupe,” states a news release from Pantone. Updating a living area with a new accent colour is a great idea particularly if, like me, you prefer a neutral colour for your walls and floor coverings. I have to believe that when we choose our colour scheme, furnishings and artwork deliberately, we create an interior that warms and envelops us – and the comfort we feel extends to our guests and makes them feel welcome as soon as they walk in the door. 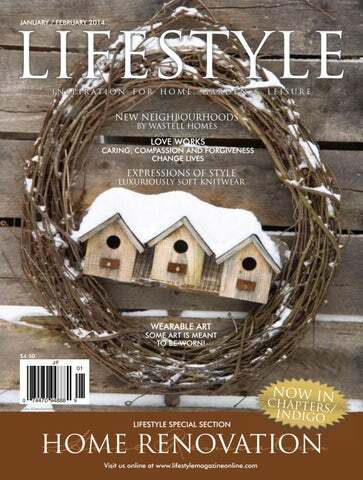 In this issue of Lifestyle, we've profiled several interesting renovations and dramatic living areas. Writer Ellen Ashton-Haiste toured a heritage building in downtown Strathroy where owners Tyler Damen and Annie Harlow are converting the second floor to a loft apartment. The couple contracted Woody's Custom Cabinetry to outfit the oversized kitchen with finishes and materials that reflect the loft's character. In Grand Bend, Oke Woodsmith Building Systems gave the owners of a single-floor cottage much-needed space by expanding upward. With its blue wood siding and white trim, the Craftsman-style cottage blends seamlessly into the established neighbourhood of heritage summer homes. And if gardening is your primary interest, you'll want to attend the Stratford Garden Festival's 14th annual show, “Beyond the Garden Gate.” The show, which will feature nine themed displays, takes place from Feb. 27 to March 2 at the Stratford Rotary Complex. WASTELL HOMES IS BUILDING TWO NEW SUBDIVISIONS WITHIN EXISTING COMMUNITIES IN NORTH LONDON By Ellen Ashton-Haiste It's not every day that a developer finds a prime city location to build a collection of new homes, says Doug Wastell, president of Wastell Homes. But his company is doing just that this year at two north London sites. Wastell is developing Bloom – 38 homes in Upland Hills, at Skyline Avenue and Bluebell Road, south of Sunningdale Road and midway between Adelaide and Richmond streets. The company is also building 44 homes in The Gates of Northridge – off Adelaide Street North and Tennant Avenue, just south of Fanshawe Park Road. Large: Stone and brick exteriors, with tapered columns, reflect the Craftsman style in the Wastell homes. Left: Large windows maximize light and views of natural green spaces Below: Master bedrooms include generous walk-in closets and ensuite bathrooms. Bloom, Wastell says, has an attractive topography, a raised elevation offering unobstructed views of the countryside to the north. This feature also allows Wastell to design some homes with lower-level walkouts that overlook a central pond. We’ve enhanced everything from Eh to Zed. The New 2014 XC60 and S60. Part of our biggest redesign ever. You can’t find this at IKEA The Gates of Northridge is surrounded by an established neighbourhood and it's close to A.B. Lucas Secondary School. It also features an expanse of green space backing onto soccer fields. These new communities will include one- and two-storey homes, which is also true of four other developments across the city's north end where Wastell is currently building – Sunningdale, Sunningdale Green, Ballymote Woods and Fanshawe Ridge. But the homes in Bloom and The Gates of Northridge are being redesigned with new elevations and interiors, the developer says. The one-floor homes will range from 1,228 to 1,500 square feet while the twostorey homes will start at 1,400 and extend up to 2,400 square feet. The homes will be Craftsman style, Wastell says, with exteriors of brick and siding, accented by stone. They will also feature covered porches and double garages. The interiors will have open-concept designs with three and four bedrooms. VERTICAL VERSION Standard features, he says, will include granite counters in the kitchens and ceramic tile with some hardwood flooring. However, the new homes can be customized to suit the needs and tastes of the purchasers. In Bloom, a vacant land condo development, buyers own theirHORIZONTAL entireVERSION home as well as the land on which it's built. The homes include a landscaping package and are priced from $306,900. Prices for the freehold homes in The Gates of Northridge start at $312,900. The first model home is currently under construction at The Gates of TEXT VERSION Northridge site and is expected to be open for viewing by February, Wastell says. Where You Live. Now building in five London locations, it is a great time to make a Wastell Home the choice for Where You Live. We are an award winning builder as recognized by the London Home Builders’ Association and have three times been awarded the 1. coveted Builder of the Year honour. a growing community in london. OPENING IN EARLY SPRING, VISIT OUR WEBSITE AND BOOK EARLY! It’s true that we have only high-quality • furniture • bedding • rugs • lighting • art • cabinetry • and more. It’s not true that we have only high prices. It’s time to LOVE where you live! CARING, COMPASSION AND FORGIVENESS CHANGE LIVES Who doesn't have something about their life that they'd like to change? What's stopping us from doing it? If there were an easy answer, we would all be walking around happier and healthier. Helping clients find those answers and facilitate those changes is what Angela Scott does through her London-based business, Procrastenough Coaching and Learning. It might be a relationship breakdown, job issues or a serious health problem. “Everyone has a different bottom rung but something in their life isn't working.” Once they do arrive, the journey to discover “why” begins. “My job is to help them understand that their current circumstances are the NSURANCE PLANS ACCEPTED result of past experiences,” Scott says. Discovering what those past experiences are is a process. Scott likens it to “peeling back the layers of an onion.” It involves talk therapy, probing questions – and plenty of listening. “It's amazing what you can accomplish just by listening, and listening with genuine empathy and compassion,” she says. As her clients gradually uncover and confront the source of their pain, Scott says they are “amazed to learn what they've been holding inside.” The challenge, then, is to deal with it so that it no longer creates a barrier to moving forward. “We talk about it, cry about it, get angry at it, journal about it,” Scott says. It all leads to opening the floodgates and letting the healing begin. Scott has a four-point formula for effecting change: • Find the pain. • Release the pain. • Forgive those who have wronged you. • Forgive yourself. Forgiveness, she says, is both a key component and a major challenge for many people, particularly forgiving themselves. Often their experiences have created feelings of guilt and shame. LONDON NORTH 1080 ADELAIDE ST. N.
Above: Angela Scott sees clients from the Southwestern Ontario region in the comfort of her Old South London home. CoolSculpt your stubborn fat. No surgery...no lipo...no needles. cosmetic procedures under a dental microscope for precision and remove only 0.3-0.7 mm of the natural tooth enamel prior to cementing the veneer on the tooth,” Tetelbaum notes. If you're considering dental veneers, it's best to book an initial consultation with an experienced dentist. Once it's determined that dental veneers are the optimum solution for you, a set of impressions and digital photos is taken. Over the course of two subsequent one- to two-hour visits, an impression is created of your desired veneers, from which temporary veneers are created for you to wear while your permanent veneers are custom created in the lab. This process takes about 10 days with no down time. “Modern veneers are designed to be as durable as natural teeth and may last a lifetime with good oral hygiene and regular dental checkups,” Tetelbaum says. “A great smile is very powerful and signals to the world that you're happy, confident and personable. It's been proven that the quality of your smile is directly related with professional and personal success,” he adds. PROFESSIONAL TEETH-WHITENING TREATMENTS ARE GROWING IN POPULARITY If you'd like a whiter smile, the methods for achieving one are quicker and less costly than you might imagine. Home whitening toothpastes, mouthwashes and whitening strips may remove surface tooth stains and discolouration, but they can't address deeper sedimentary stains, according to Debra Hall, a staff nurse at Pro Health Medi-Clinic in St. Thomas, which specializes in teeth whitening. “Our professional teeth-whitening process delivers highquality, pain-free results in a one-hour session that removes subsurface sedimentary and surface teeth stains,” she says. At Pro Health Medi-Clinic, teeth whitening takes 45 minutes to an hour. It follows a consultation during which the patient's health history is discussed, and before and after photos of his or her teeth are taken for reference. “Teeth whitening is safe for natural teeth, as well as for those with veneers, caps, crowns and dental implants. Our technicians work hard to match the colour of your natural tooth enamel,” Hall says. A whitening gel solution is brushed onto your teeth and is activated by a special heat lamp. “The whitening process shouldn't be done on open cavities, pregnant or lactating women, individuals under age 14 or patients receiving chemotherapy,” Hall notes. A professional teeth whitening process should be done only once yearly; however, a 20-minute “top-up” treatment can be done every six months. The cost for professional teeth whitening at Pro Health MediClinic ranges from $120-$140, depending on your pre-existing level of dental staining. “Although our clinic offers a growing list of medical cosmetic services, professional teeth whitening is our primary business. Requests for teeth whitening are growing in demand from both men and women,” says Hall. Let us help you look your best for Valentine’s Day! This year, make a resolution to publically express your creative side. Just as art on the walls of your home or office personalizes your space, wearable art customizes your appearance. It announces to the world you are not a slave to fashion; you are a trendsetter. Eschew the buying-off-the-rack mentality and stave off the fashion doldrums with hand-made garments, purses, hats, scarves and jewellery. Patricia Richardson is a Canadian textile artist and the lead organizer of London's fall Wearable Art Sale which brings together a passel of individual crafters including five listed below. Richardson studied fashion design, fabric design, embroidery and millinery at various institutions. She pursued a career as a costume designer before narrowing her focus a few years ago to hats and accessories. Richardson built her creations from the bottom on up. She dyes and paints fabrics and then, working from her own patterns and designs, cuts and manipulates them into shapes. These she embellishes with beading, embroidery and pleating to create unique pieces of wearable art. Mary Louise White is a woman of many talents. When she applies her considerable skills to the process of making jewellery, something magical happens. Working with glass, White conjures oneof-a-kind pendants and earrings that shimmer and shine. Jessie Gussack's Jersey Lovey label was born when the designer wanted something fun to wear. She made her first infinity scarf and soon found everyone wanted one. Gussack works from a range of fabrics to create fluid pieces that add a dash of colour to any ensemble. Feeling buggy? Debra Jeffries of Debra's Divine Designs produces recycled, genuine butterfly and insect wing pendants, earrings and more. Her ethically farmed butterfly and insect specimens are purchased from a licensed supplier. Jeffries also uses a variety of recycled metals in her pieces including sterling silver and copper wire. Lisa and Pete Wright of Wright by Design are business – as well as life – partners. They channel Peter's 25 years as a master furrier and Lisa's fashion and theatrical wardrobe background into the creation of up-cycled fur hats and bags and fur-trimmed clothing. Below: Swarovski crystal and sterling silver necklace by Part Crow Custom Handmade Jewelry. Above: A true Canadian original. Anne-Marie Chagnon's remarkable signature designs are recognizable at first glance. Enjoy her wearable art exclusively at Framing and Art Centre at Richmond and Kent in downtown London. Jeanne-Marie Urbach, who produces colourful scarves and knit shawls, describes her work as running the gamut from practical to zany. She is inspired by nature and fabric. Says Urbach: “Wearable art appeals to my practical side while allowing for limitless creativity.” Wandering away from the Wearable Art Sale gang, one finds Colleen Turner and Anne-Marie Chagnon. Turner, of Part Crow Custom Handmade Jewelry, addresses her own love of shiny things by working with sterling silver, pewter, semi-precious stones, shell and coral, as well as pearls and crystals from all over the world to produce finely crafted jewellery. Montreal-based designer Chagnon's work can be seen in London at the Framing and Art Centre. Her playful pewter, wood, resin and glass pieces have a decidedly primitive feel. Some are designed to be transformed at the whim of the wearer from necklace to bracelet to earrings – the ultimate tribute to personal expression. There you have it, eight innovative ways to express yourself in style in 2014 – with a little help from Canadian artisans. Now that's an easy resolution to keep! See uS at the London LifeStyLe Sh ow Jan. 24, 25 & 26 - Boot – h 17a vanGogh Chalk Paint Collection – CANADIAN owned and made " WORKSHOPS AVAILABLE " INVENTORY & ADVICE " ONE-OF-A-KIND painted furniture " Canadian & North American made giftware " STUDIO TIME AVAILABLE "
London-based designer Cindy Goble, of Cindy Goble Inc., and her team of professionals hand knit luxurious shawls, infinity scarves and other neckwear into uniquely warm expressions of style that can be dressed up and down. “I'm a third-generation knitter who is very proud of my German and Lithuanian roots. My professionally constructed, luxurious pieces of wearable art are inspired by the beauty of nature,” says Goble. Goble's handmade knit accessories are luxuriously soft as they're fashioned from highquality yarns with colours, textures and finishing touches that vary with each accessory. Designer, Cindy Goble wearing one of her creations. Current styles include circular infinity shawls that are worn looped and draped into elegant neck-encircling layers. They are also wide enough to wear over one's head, resembling a hood. As well, infinity shawls are large enough to wear as a shoulder-topping capelet over dresses and tops to ward off indoor chills après ski, at home and on dressier occasions. Goble's infinity shawls from her “Whimsical Collection” feature a blend of locally and globally sourced yarns. Each piece bears the discreet signature of a small heart-shaped charm. “Yarns used to create my designs include Merino wool, hypoallergenic alpaca, silk and mohair. Many also feature interwoven satin ribbon and sheared beaver yarn,” says Goble. Other designs include the “Crazy About Cable” knit cable neckwear collection and the “Majestic Collar” collection that was recently designed by Goble's 17-year-old daughter, Grace. Inner Beauty is ... the beauty that comes from inside, from the food we eat, the thoughts we think, and of course, pure, clean makeup and skincare products! The “Bubble Bauble” and “Magic Shawl” collections are embellished with strikingly noticeable findings and elements, including large buttons, vintage brooches and decorative trim. Goble learned to knit from her mother and grandmother and she expresses special pleasure in welcoming her daughter into a family knitting tradition that's become a growing business. “About four years ago, I started knitting cosy shawls and neck pieces for myself and my family as a relaxing way to be creative,” Goble recalls. “ I felt honoured to be increasingly stopped by others who admired my knitwear and asked where they could buy such pieces for themselves.” She launched her business after realizing that there was a genuine demand for her knitwear. “I employ as many as 12 local professional pieceworkers. I personally oversee the process to ensure that our professional high standards for luxurious quality are met,” Goble adds. Although her products are available locally at shops such as Fisher and Company, Goble's business continues to expand further afield. Her pieces are sold in boutiques in Blue Mountain, Langley, B.C., Montreal, and in Vail and Aspen, Colorado. “Although my knit neck pieces can be worn three seasons of the year, I'm also looking forward to developing yearround designs, such as pouch purses and vests,” Goble says. Grace Goble, Cindy’s daughter, wearing an off-white scarf. Quality Service is Our Specialty! that allow more time for other things! Prices starting from $385,000. See sales representatives for more details. Carl and Marvin Stephenson are brothers and owners of the business that their father began in 1959. Every job is priced by a Stephenson and done by a Stephenson. They value their customers, whose satisfaction is their goal. Visit their large showroom to look and try out their products. The company is so confident in what they do that they stand behind their workmanship with a lifetime guarantee. The work is never subcontracted. All quotes are free! the established location in London's west end fits well with the premium brand's demographics. The dealership was able to persuade corporate management it could create the degree of visibility the store needed with appropriate redesign at the existing site while retaining its connection with its customer base. It appears that game plan was a winner. The iconic tower, the tallest among Canadian Acura dealerships, features life-size pictures of five Acura products, two more than can be accommodated in the brand's conventional tower design. Custom-cut glass walls soar from ground level to the ceiling 26 feet above the showroom, which has about the same display area (4,500 square feet) as the original building. However, the difference between old and new is dramatic. The previous showroom lacked natural light, but its dingy atmosphere has been replaced by a bright, airy area that's ideal for showcasing the Acura lineup. Above Inset: Paul Jennery, the general manager at Acura West. In summer, it's Canada's Caribbean alternative. In winter, it's a wonderland of white. In all seasons, Brentwood On The Beach offers an ever-changing canvas of Lake Huron waterscapes. Every day provides a different experience of that canvas, says Joan Karsten, who has operated the upscale bed-and-breakfast inn, with her husband, Peter, for the past 23 years. “The sun shimmers on the water in the summer and, in the winter, the clean white snow and ice sparkle,” says Joan Karsten. It's also hard to match the drama of wind cracking the ice into sculptures on the lake, she adds. Top: The view from the rear balcony. Below: Relax along the willow-lined shore. Right Top: The indoor pool. Right Middle: A rear view of the home. Right Bottom: The living area has fabulous views of the lake. The 10,000-square-foot home, on a bluff overlooking 140 feet of private beachfront, is available for a discerning purchaser. It's listed at $2.45 million with John Crosby, a sales representative with Royal LePage Triland Realty. The possibilities for the property are endless, Crosby says. “Its capacity as a B&B is intriguing but it's attractive for many different purposes.” He cites some of those options: intergenerational family compound, corporate retreat, beach spa, “or simply your own home to roam around in and pamper yourself.” Crosby says the Karstens have created a “tremendous progression of spaces,” each with its own ambiance and each offering scenic vistas of the lake and surrounding landscaped lawns and gardens. “A wealth of windows capture that canvas from all vantage points,” he says. Built into a hillside, the house offers full floor-to-ceiling views as well as outdoor access from both the main and lower levels. Serving the London area since 1986. Serving Elgin County for Over 8 Years! Above: Direct access to the beach. t Oke Woodsmith, we do much more than build houses. We take design ideas from A our clients, meld them with our own, and keep our collective relationship on track during the construction process and beyond. It’s not just our communication skills that attract clients to our company, however. We keep ourselves, and our tradespeople, up-to-date on advances in building science. We’re building not just for the decade, but also for the century. ur hope is that the next generation will renovate and update our buildings a hundred years from now. Mark and Clare Schmehl realized their family was outgrowing their Grand Bend cottage, but they were reluctant to leave the neighbourhood where Mark's parents have also owned a cottage for more than a decade. But expanding on the already-small lot presented some challenges. They wanted to preserve landscaping they had recently completed, including a backyard cobblestone entertaining area. They turned to Oke Woodsmith Building Systems and the team there proved equal to the challenge. The single-storey cottage was rebuilt in the footprint of the original, expanding upward. The Schmehls couldn't be happier with the result. They particularly appreciate the fact that the new cottage blends seamlessly into the established neighbourhood. “It looks like it belongs – new, but like it's been there forever,” says Clare Schmehl. Top: The cottage’s front exterior after the renovation. Inset: the cottage’s front exterior before the renovation. Bottom Left: A patio door leads from the kitchen and dining area at the rear of the cottage to a backyard deck and entertaining area. Bottom Right: The interior of the cottage was opened up to create a great room at the front and a dining area and kitchen at the back. Randy Oke, a partner in the Grand Bend-based company, says the Craftsman style was chosen to blend with the other heritage cottages nearby. The blue wood siding, with white trim and accents of natural cedar shakes and manufactured stone, gives the cottage a “coastal feel,” adds Oke Woodsmith designer Steve Poortinga. The family is grateful that the original partially covered front porch was preserved. “That's a key spot,” Schmehl says. “We sit there all the time, turn on the gas fire pit and read or play games.” The melding of modern convenience and cottage character extends through the interior. The 642-square-foot main floor was opened up, creating a great room at the front and a dining area and kitchen at the back, with a patio door that provides access to a deck. Replacing the former pine panelling with white walls and ceiling accentuates the sense of spaciousness, balanced by the warm wood tones of hickory hardwood flooring. A beadboard ceiling with crossbeams and the inclusion of the original wood stove, now converted to gas, maintains the cottage ambiance. The kitchen, by Woody's Custom Cabinetry, features new white cabinets, distressed to make them appear worn. Engineered quartz countertops, with a subtle weaving of white and light grey, are offset by a backsplash of patterned porcelain tiles in shades of blue and burgundy. The tiles, and those in the second-floor bathroom, imported by the Schmehls from Spain, are one of Clare Schmehl's favourite elements. “Our designer in Oakville (the family's home city) said they would match my funky style and she was right!” Schmehl says. Because of the cottage's small square footage, every inch had to be used. For example, a small crawl space under the original cottage was enlarged to create room for a gas furnace and humidification unit. The space, accessed through a panel in the staircase wall with a ladder leading down, is also enjoyed by the couple's children, who have taken it over as a secret hangout. “It's their own little cave,” Schmehl says. “There wasn't enough space before for them to sit down on a rainy day.” A two-piece bathroom is tucked under the staircase, further maximizing available square footage. “In a small cottage you need all the space you can get,” Oke observes. From the foyer, the staircase leads to the second floor with three bedrooms and a bathroom. The children, ages 10 and 12, are thrilled to have their own rooms. “For a boy and a girl, the two bunk beds in a single room just wasn't working anymore,” their mother says. A front gable dormer accommodates a cosy master bedroom, with two spacious closets. The bathroom features a double vanity and a shower/tub surround with tiles that resemble rustic wood planks. “We love our new cottage!” Schmehl notes. Below: From the foyer, an open staircase leads to the second floor. A panel in the staircase wall provides access to an enlarged crawl space, created to accommodate a furnace and humidification unit. Dark-stained maple cabinetry, white counters and stainless steel appliances give the space a dramatic appearance. MODERN HERITAGE The rear windows flood the new kitchen with additional natural light. Left: The central chimney was incorporated into the design, finished in ledge rock and the kitchen island was built around it. The chimney was finished in white ledge rock, providing a clean modern appearance, and a five-by-five-foot island was constructed around it. It's one of the couple's favourite aspects of the new kitchen, Nathan Fish says. There was “a lot of engineering that went into the process,” but successfully removing the wall opened up the space by 30 to 40 per cent and added significantly more natural light from the rear windows and a patio door leading to a back deck, Hodgson says. The colours in the original kitchen – white and neutral tones – had “gotten old,” Fish says. Old Castle gave the space what Hodgson calls “a dramatic appearance,” installing dark-stained maple cabinetry, engineered white quartz counters and stainless steel appliances. “It's a much more contemporary and modern look,” Fish agrees. Hodgson says that the new cork flooring added to the aesthetics and made the floor softer underfoot. The renovation included expanding the small second-storey bathroom, almost doubling its size, and adding a new tub, a glassed-in shower and a vanity that resembles the kitchen finishes with darkstained cabinetry and a quartz counter. Fish notes that he and Janet took advantage of the renovation to complete additional infrastructure work by updating the plumbing and the electrical wiring. The couple is thrilled with the results of the renovation. Although they had to move to a hotel for four weeks, Fish says they were impressed at how efficiently the work was completed. This photo: A dramatic centre island, black Caesarstone counters and white Shaker-style cabinetry give this kitchen a bright and modern appeal. “We could probably have built a new home faster than it took for this renovation,” the owner of a heritage home in London's Old North says, describing the project that stretched over six months last spring and summer. “But the results are worth it!” For a decade, the homeowners had coped with a small kitchen, while a full industrial kitchen, almost twice the size and added by a previous owner, went largely unused. At the same time, the family that had grown from one to three young children in that decade was cramped in four small bedrooms and one bathroom on the second floor. It was time for a change but they didn't want to move. So, working with Melchers Construction, they replaced the back of the home, creating a large, modern kitchen in the footprint of the industrial kitchen. Since the industrial kitchen was a single-storey addition, Melchers constructed a new master bedroom and ensuite bathroom above that area. Eliminating the industrial kitchen also allowed them to expand the basement by opening up a previously inaccessible crawl space. The small kitchen was converted to a dining room. Above: The former small kitchen was converted to a dining room with a built-in desk. DESIGN FOR LIVING. BUILD FOR LIFE. During the renovation process, the ceiling in the new kitchen was raised a foot and the windows were extended. “It's incredible how much brighter it is and how much more open and spacious it feels,” the owner says. The new galley-style kitchen is anchored by a four-by-10-foot island with a white engineered quartz counter and a dark-stained maple base. With seating for five along one side, the island is a favourite family gathering place. The bright, modern ambiance of the workspace is underscored by pendant lights suspended above the island, a pale marble backsplash and stainless steel appliances. Black Caesarstone counters along the perimeter form a dramatic contrast to the white cabinetry, by Woody's Custom Cabinetry. The beaded Shakerstyle doors reinforce the home's heritage character, a theme that has been repeated in the decorative grilles on the windows and terrace door. Top: Two islands, each four-by-14 feet and topped with concrete counters, provide the central focus for the loft kitchen. Above: Seating along the outside ledges of the islands accommodates 10 people. Creating a kitchen for a loft apartment in a downtown Strathroy heritage building was a designer's dream project. “It was a blank slate,” says Shawn Fentie, of Woody's Custom Cabinetry. “It was gutted and there was a vast open space for us to play with. You can be really creative with something like this.” The second floor of the building – initially an open expanse – is being converted by owners Tyler Damen and Annie Harlow. Damen purchased the building, home to the Strathroy Age Dispatch for more than a century, for his chiropractic office. He didn't intend to live upstairs but the character of the space captured his imagination. Damen has constructed a series of rooms along one side of the loft. The remaining area will encompass a living and dining area and the kitchen, which can be accessed by an open stairway from the outside entrance. The couple initially wanted one central kitchen island but Fentie had a different vision. The size of the space prompted him to suggest two parallel islands. “When he sent me the drawings, I said, 'Oh yeah, that's definitely it,” Damen notes. Woody's installed the bases for the four-by-14-foot islands, which are topped with seamless concrete counters. “It's a good product for the space,” Fentie says. “It's not made to look perfect.” Concrete is also unique for a residential kitchen. The weight of the counters – each about 1,500 pounds – calls for a heavy-duty base. The floor that, for many years, withstood the force of the newspaper's printing presses provided the necessary support. The counters were poured onsite and required 12 men to lift each one onto the cabinetry base. Above: Several windows along the wall of the kitchen provide views of downtown Strathroy. While the concrete was still wet, Damen inserted subtle lines of darker materials to give a variegated appearance to the finished white surface. At the end of one, a scooped-out indentation provides a permanent fruit bowl. A silica counter, with a narrow backsplash of ceramic glass tile and a concrete sink, overlooks the stairway and provides additional workspace. Fentie points out that, except for a narrow cabinet above the oversized refrigerator flanking the end counter, there are no upper cabinets, which enhances the open-concept design. A large square ventilation hood over the gas stove, built into the centre of one island, provides an overhead focal point. Deep drawers in the islands and counter provide ample storage and a pantry will be constructed over the stairway behind the refrigerator. Grey-stained maple cabinetry was hand-glazed, then distressed to make it appear old, in keeping with the loft's character, Fentie says. While other sections of the apartment are still a work in progress, Damen says he and Harlow are relishing their kitchen. With seating along the outside of each island that accommodates 10 people, the kitchen is perfect for the two of them and is also ideal for entertaining, he says. created by designers and artisans whose services Cameron contracts. Other trends include more demand for trim made of cellular PVC, which is solid, easy to clean and has no moisture issues. Homeowners also request windows and doors that are stained to match furniture and cabinetry, and items that are pre-finished before installation, such as doors that are painted before they are hung. “People's lives are busy these days. They don't want to spend their free time on those kinds of tasks,” Watson says. With time being a concern, many customers are happy to work with one company from start to finish. If they walk in with their blueprints, Watson's staff can carry the project through to finished, installed products. Cameron Window and Door has experienced stable sales and growth, despite fluctuations in the housing market, because roughly half of their work is in new homes and half in renovations. “When new builds slow down, renos tend to pick up, so that helps smooth out sales,” Watson says. Artistry. Integrity. These time-honoured principles are built into every Hubbardton Forge fixture. Each piece is hand-forged one at a time by skilled artisans at their forge in Castleton, Vermont. When you own a Hubbardton Forge chandelier or lamp, you own a piece of Vermont-made art. Shown below is the Corona adjustable pendant in a dark smoke finish with glass dome diffusers. Your surroundings reflect your taste and preference, and Feiss fixtures, lamps and home decor accents are designed to achieve that feeling. Feiss sources nothing but quality metals and materials and offer an array of finishes to achieve distinctive looks that complement every style of interior and exterior design. Shown to the right is a chandelier from the Adan Collection. MONTE CARLO FAN CO. Monte Carlo Fan Co. is dedicated to designing fans that are beautiful to look at and also engineering them to work efficiently. Each element is designed to contribute to exceptional performance and overall energy costs savings. With whisper-quiet operation and a lifetime warranty, these ceiling fans enhance lifestyle and room environments. Shown below is a fan from the Aviary Collection. SNOC EXTERIOR FIXTURES Snoc exterior fixtures are manufactured in Canada for the Canadian climate. Made from the highest grade of aluminum, Snoc confidently offers a lifetime warranty. With more than 35 styles, 23 colours and glass options, you can customize your fixture to perfection. Complete your look with their selection of mailboxes and house numbers. Shown is a wall fixture from the Westminster Collection. VINTAGE BULBS The options are limitless when it comes to Bulbrite’s Nostalgic Collection. These handcrafted, vintage bulbs are the perfect complement to any antique or contemporary décor. Inspired by Thomas Edison’s original creation, they offer an unparalleled aesthetic appeal with an antique finish, defined steeple and intricate filament design. Shown is a tubular bulb from the Nostalgic Collection. All shown above are available at Living Lighting (Exeter Rd. ), London. Collect Air Miles rewards while you renovate your home! Offer effective between January 1st and April 30th, 2014. † Purchase 3 Duette® honeycomb shades with PowerRise® and receive a $200 rebate. Also, when you purchase any number of these additional shades, you’ll receive an extra $50 for each. To learn more about PowerRise,® please visit hunterdouglas.ca. Valid at participating dealers only. *Effortless Style rebate will be issued in the form of a Hunter Douglas Prepaid American Express® Gift Card. THE PROMOTION CARD is a trademark of Hunt Diversified Marketing Inc. All Rights Reserved. THE PROMOTION CARD is a Prepaid American Express® Card issued by Amex Bank of Canada. ® Used by Amex Bank of Canada under license from American Express. Free measuring and installation. Serving London and area for 10 years. Financing options available. RENOVATION MARKETPLACE PENDANT LAMP This versatile pendant has a rustic charm with its solid wood base and flexible cage surrounding an Edison bulb. The cage moves to open as shown or it can be closed for a sleeker look. The cast-iron accents are reclaimed from old machine parts and melted down to create these great pieces from District Eight. PETERSON CHAIR This chair is perfect for curling up with a book and some hot cocoa this winter! District Eight blends function, form and beauty and defines a past where pride in craftsmanship is upheld in the designs. The combination of raw materials and natural patinas applied to reclaimed boat wood and castiron accents provides a unique foundation for a furniture line that is unlike any other. MERCANA ACCESSORIES Accessories make a visual statement and add warmth and charm to every home. Warehouse 74 loves adding vintage pieces to every type of space whether it is contemporary or rustic inspired. There is always something new and eye-catching! VINTAGE MARQUEE AMPERSAND LIGHT If a picture paints a thousand words, Vintage Marquee lights tell a story in an instant. Charming, unique and full of soul, each light breathes personality into your space. The original creation of a husband-and-wife team, they are designed to show artistic spirit. Warehouse 74 offers artwork and lighting of all styles, including abstract and figurative urban in wood, metal and hand-finished materials. Mercana offers a variety of artwork to fit everyone's style and taste. Unique lighting designs are sure to spark a conversation! All shown above are available at Warehouse 74, 21758 Richmond St. N, Suite 102, London. RENOVATION MARKETPLACE LUXURY PERFORMANCE TOILETS American Standard offers a complete line of concealed trapway, luxury performance, high-efficiency, ultraJASON WU FOR low consumption toilets. With offerings in a variety BRIZO FAUCET of styles and price ranges, these 4.8 Lpf toilets use 20 per cent less water and meet all EPA water sense Fashion forward meets forward criteria. With a 10-year warranty on the entire toilet, thinking in a study in contrast... the Boulevard features an elongated siphon action introducing Jason Wu for Brizo. bowl, smooth sides, a slow-close seat and cover that This exclusive bath collection GROHE lifts off for ease of cleaning. features the aesthetic sense of a MINTA renowned fashion designer, coupled TOUCH with design and innovation including SmartTouchPlus™ and TempIQ™ FAUCET temperature control technology It's easy to fall in love with the GROHE that could come Minta Touch. It's sensitive. With its only from Brizo. innovative EasyTouch technology, it instinctively reacts to the slightest touch. One tap of the Minta Touch with the back of your hand, wrist or forearm is all it takes to turn it on or off, thus keeping the faucet clean and hygienic at all times. If your hands are clean, simply use the manual lever to adjust flow and temperature. GROHE Minta Touch is simple, sensual, moving – a hybrid faucet that intelligently unites two operating functions in one. All shown above are available at Brouwer Plumbing and Heating, London. Modern design aesthetics are featured in the Felix vanity from the exclusive Woodhaus Bath Series by Möbelhaus Furniture and Cabinetry. The Sven vanity is a clean, modern bathroom vanity with exposed storage for accents. The drawer is constructed with soft-close slides providing maximum storage in a compact space. Depicted in maple, you can get it custom-built in a variety of wood species and finishes. CENTURY VANITY The Century vanity collection is unique... as in every single one is different. Clad in reclaimed barnboard, you can take a piece of our agricultural heritage home with you. While it looks like it may be near the end of its life, the construction inside is built to modern standards, cut with CNC precision and utilizing state-of-the-art hardware to give you the best of both eras. All shown above are available at Mobelhaus Furniture and Cabinetry, Aylmer. BJORN VANITY SERIES The Bjorn vanity series adheres to minimal, European-inspired design principles with the open spacious feeling found in wall-mounted vanities. Pair it with various tops and faucets to shake up the look to suit your preference. Choose a matching side or wall cabinet for even more storage solutions. At Goris Electric, we are committed to providing a full range of cost effective, quality, electrical services to our customers. Our highly trained & licensed service technicians provide, fast, friendly and knowledgeable electrical services. Our modern fleet of well- maintained service vehicles are stocked with the right equipment and materials to suit your job and complete in promptly! The text is the same as the ad RoNA, Strathroy from sept oct 2013, page 36. The Grand Theatre in a font that is a bit better to read. W PS - if you have time to do 3 proofs that might not be a bad idea. If he doesn’t like any of them he is going to have new photos taken. RENOVATION MARKETPLACE DALTILE MARBLE ‘FIRST SNOW ELEGANCE’ While square-shaped tiles lend themselves well to a more traditional aesthetic, linear/rectangular and plank-shaped tiles of various sizes create a clean, elegant and contemporary feel, especially in natural stone or faux hardwood finishes. Customize the look by installing tiles in alignment, brick patterns or on a 45-degree angle. MAX WINDSOR MAGIQUE COLLECTION ‘ENVISION’ This engineered hardwood line has a European oak plank appearance that has been gently wire-brushed, giving it a soft matte finish. What sets this line apart is that the product comes in 3 1/2-, six- and 9 1/2- inch widths all installed together with random lengths of up to seven feet, giving the floor a very unique and high-end look. KARNDEAN VAN GOGH ‘EBONY’ With all the beauty of a natural wood floor minus any of its drawbacks, luxury vinyl plank flooring has become a great option for the space inhabited by four-legged friends, busy kids and grandkids, or any area of high traffic TERAGREN BAMBOO STRAND COLLECTION that needs to be durable ‘CAFÉ PORTFOLIO PARIS BLACK’ as well as beautiful. Most varieties of wood Bamboo creates an exotic and contemporary feel, and is now are well represented at more versatile than ever with new colours in the line-up. many price points. Instead of just natural or steamed/caramelized bamboo, this truly sustainable product can be infused with much darker shades and can even be hewn to give it a hand-scraped appearance. All shown above are available at Under Foot Flooring Inc., London. 55 Luxury Detached Condominiums overlooking the Thames River 4700 Hamilton Rd., Dorchester, ON Starting at $299,800. BARRY WADE HOMES presents a boutique adult community committed to excellence in living and the preservation of nature and history. Situated on an historic site featuring riverfront lots, beautifully landscaped gardens and the quality, luxury and design Barry Wade is known for. Experience the tranquility of this peaceful setting while having easy access to the city! A beautiful alternative when downsizing, offering the security of owning your own home and land while enjoying freedom from lawn maintenance and snow removal! *The ENERGY STARÂŽ mark is administered and promoted in Canada by Natural Resources Canada and used with permission. Barry Wade earned his chops working with eight different architectural firms before opening his own design business in 1987. Four years later, he expanded into building as well. Since then, Wade's company, Barry Wade Homes, has developed a reputation and garnered multiple awards for unique designs coupled with quality construction in residential and commercial projects. “We design everything that we build, but about 10 per cent of what we do is still strictly design,” he says. Along the way, Wade also honed his project management skills and two years ago was recognized for volunteering his time for an unusual project management challenge. He was part of the team that worked to bring the decommissioned HMCS Ojibwa submarine from Nova Scotia to Port Burwell. Wade has been involved in design and construction projects across Canada, the U.S. and in Barbados, from residences to small medical buildings and the Bellamere winery building. “We're known for our high-end design work and we have worked on up to $14-million homes, so people may think we're expensive or that they can't afford us, but that's a fallacy,” says Wade, who also enjoys working on smaller home design and construction projects. The company's newest venture, Village on the Thames, is Wade's first foray into condominium development. The upscale adult lifestyle community, located just 10 minutes east of London in Dorchester, offers 55 detached condos in a picturesque setting overlooking the Thames River. “It's one of those rare finds,” says Wade – a 14-hectare property in a natural setting with walking trails and gardens, but close to all of amenities of Dorchester and London, and with easy access to Hwy. 401. Above: Barry Wade’s office in Dorchester. Right: Wade takes pride in design-build projects that combine unique designs with quality construction. *Not valid with any other offer. Discount off regular list price. Limited time offer. Previous purchases do not apply. Not redeemable for cash. Eliminates unsightly and unhealthy mildew, mold and bacteria. The site has an interesting history, Wade says. In the past, stage coaches and travellers skirted the property on the toll road that led past it. An archeological review found that even further back in time, two separate Neutral Indian villages had been located on parts of the land. A dig unearthed a number of artifacts that have since been professionally exhumed, catalogued and stored. “The Neutrals were well known for their pottery and there were a number of interesting pieces found on the site,” says Wade, who has plans to produce a book that captures some the site's history, along with photographs of some of the items found there. Three generations of inspiring bath and kitchen products from our family to yours. Inset: Left, owner Jeff Robb. Right, manager Mike Apostolopoulos. Celebrating 5 years of custom, pull-out, Canadian shelves. Weâ&#x20AC;&#x2122;re thrilled itâ&#x20AC;&#x2122;s been 5 great years of helping Canadians make the most of space in their kitchens, bathrooms, pantries and even under their sinks! Only Gliding Shelf Solutions creates custom, pull-out shelves for your existing cabinets right here in Canada! We look forward to helping you organize, increase space and put everything at your fingertips, all within your budget. THIS YEAR’S STRATFORD GARDEN FESTIVAL INVITES VISITORS TO EXPLORE THE MYSTERIES ‘BEYOND THE GARDEN GATE’ By Ellen Ashton-Haiste An enchanting garden, inspired by Irish lore, with fairy homes and evidence of the “wee people.” An oasis with a sitting area shaded by a pergola and bracketed by water walls. These are just a couple of the spaces visitors can explore “Beyond the Garden Gate” at the Stratford Garden Festival's 14th annual show, Feb. 27-March 2. “Few things are as enticing as an open gate,” says Deedee Herman, area manager of The Lung Association, which presents the festival. “The image is an invitation to enter the space beyond and explore what surprises await there.” The festival, sponsored by Orr Insurance and Investment, will be held at the Stratford Rotary Complex. Local landscapers and garden centres will create nine themed displays, from outdoor entertaining oases to practical spaces demonstrating ideas such as water features and the use of colour. “The gardens are always intriguing, unique each year,” Herman says. Items for creating the ideal garden are available in the Marketplace. Herman notes that there will be some new vendors there this year with novel plant materials, backyard greenhouses, fairy doors, local garlic and much more. Garden gurus, featured in the Speaker Series, will discuss myriad topics including “power plants” for health, the best British gardens, and creating a hobby greenhouse. “I am always amazed by the quality of our speakers,” Herman says. “We are truly blessed to have the support of so many top garden experts.” Special events include an Opening Garden Party (6 p.m.-8:30 p.m.) and Seniors' Tea, both on Thursday, and Family Fun Night (5 p.m.-8 p.m.), with free kids' admission, on Friday. Some 9,000 visitors are expected, netting about $60,000 for The Lung Association programs and research. PAUL GAUGUIN CRUISES NAVIGATE THE REGION’S TURQUOISE WATERS The islands and atolls of French Polynesia are unmatched in their beauty. They offer lush rain forests, beaches and barrier reefs, as well as intriguing cultures immortalized by novelist James Michener, songwriters Rodgers and Hammerstein, and artist Paul Gauguin. The m/s Paul Gauguin is a 332-guest vessel that was designed to cruise the South Pacific. It navigates the shallow waters that surround the islands as easily as a yacht. The ship's informal ambience reflects the relaxed nature of the region. A much-loved troupe known as the Gauguines – Tahitians who serve as staff, entertainers and storytellers – add a South Pacific flavour to life on board. The Gauguin also offers an all-inclusive experience with airfare from Los Angeles, gratuities, 24-hour room service, bottled water, soft drinks and select wines and spirits included in the cruise fare. All suites and staterooms offer ocean views and nearly 70 per cent have private balconies. A crew-to-guest ratio of one to 1.5 ensures a high level of personal attention. The exclusive treatment continues ashore. Guests can enjoy a day on the cruise line's private isle, Motu Mahana, complete with snorkelling, full bar service and a barbecue with Polynesian entertainment. The ship also features a retractable watersports marina from which guests can kayak or paddleboard. Nightly entertainment draws upon the traditions of the South Pacific. Listen to the a cappella harmonies of himene – formal Tahitian choral songs – or watch a riveting performance of the otea, a complex line dance accompanied by drums. Singers croon as couples take a spin on the dance floor in the observation lounge at the top of the ship. A casino and piano bar round out the options for evening diversions. LIFESTYLE r e s o u r c e s Address and website information for the companies and/or retailers featured in the articles in this issue are listed by order of story below. P. 8 New Neighbourhoods Contact: Sue Wastell, Wastell Homes, (519) 850-0020, www.wastell.ca P. 13 Love Works Contact: Procrastenough Coaching and Learning, (519) 936-7830, www.procrastenough.com P. 17 Dental Veneers Contact: Synergy Centre Dental and Health Care, (519) 266-3600, 1635 Hyde Park Rd., www.synergycentrelondon.ca P. 18 Whitening Your Smile Contact: Pro Health Medi-Clinic, (519) 207-8338, 1010 Talbot St., Suite 32, St. Thomas, prohealthteeth@live.ca P. 19 Wearable Art Contact: Patricia Richardson, (519) 438-7215, www.paddyk.ca; Wearable Art Sale, thewearableartshow.blogspot.ca; Colleen Turner, www.partcrow.com; Framing and Art Centre, (519) 438-2534, 188 Kent St., www.framingandart.ca P. 22 Expressions of Style Contact: Cindy Goble Inc., www.CindyGoble.com P. 27 Renovations at Acura West Contact: Acura West, (519) 657-1557, 759 Wonderland Rd. N., www.acurawest.ca P. 28 Lifestyle Distinctive Property for Sale – Brentwood On The Beach Contact: John Crosby, Royal LePage Triland Realty, (519) 777-2659, www.johncrosbyproperties.com P. 33 The Little Cottage that Grew Contact: Oke Woodsmith Building Systems, (519) 238-8893, www.okewoodsmith.com P. 36 Modern Heritage Contact: Mike Hodgson, Old Castle Renovations, (519) 860-9640, www.old-castle.ca P. 39 Breathing Space Contact: Melchers Construction, (519) 473-4149, www.melchersconstruction.com P. 42 Lofty Presentation Contact: Woody's Custom Cabinetry, (519) 473-7338, 1491 Fanshawe Park Rd. W., www.woodysmfg.com P. 45 Ease of Maintenance Contact: Cameron Glass and Window, (519) 473-0002, 1195 Gainsborough Rd., cameronwindow.ca P. 55 Distinctive Designs Contact: Barry Wade Homes, (519) 268-2995, www.barrywade.ca P. 59 A Corner Pharmacy with a Twist Contact: Turner Drug Store, (519) 672-3340, 52 Grand Ave., www.turnerdrugs.com P. 61 Orchard of Dreams Contact: Mike Vansteenkiste, Twin Pines Orchards, Cider House and Estate Winery, (519) 296-5558, 8169 Kennedy Line, Thedford, www.twinpinesorchards.com P. 63 Stratford Garden Festival – “Beyond The Garden Gate” Contact: Deedee Herman, The Lung Association, (519) 271-7500, www.stratfordgardenfestival.com Tickets cost $9 (children under 12 free). The festival, held at the Stratford Rotary Complex, 353 McCarthy Rd., Stratford, is open on Feb. 27, noon-5 p.m.; Feb. 28, 10 a.m.-8 p.m.; March 1, 10 a.m.-6 p.m.; March 2, 10 a.m.-5 p.m.
LOVE EVERY INCH OF YOUR HOME THE RENOVATION CHALLENGE Renovate the existing closed-off and dark kitchen to create an open, family friendly space, perfect for casual entertaining. Removing the load-bearing wall between the kitchen and dining room really opened up the two spaces, and the full height cabinets with beveled glass inserts balance the modern feel with the rest of the house. The footprint of the kitchen has not changed drastically, but the storage and overall efficiency has. The new central island hides the pantry storage and moving the new counter-depth fridge closer to the dining room puts the most used appliance in the middle of the room.